Surveys regularly reveal that the overriding ambition of the young is to be famous, even if it is only for the 15 minutes that Andy Warhol proposed as everyone’s due. After a 59-year wait I have just had my own small ration of notoriety as a result of BBC2’s Iceland Foods documentary. Let me tell you now, kids: it is not all that it’s cracked up to be. For a start, being vaguely recognisable from the television gives total strangers the impression that they are licensed to greet you by your first name. No problem for the youth of today, I suppose, but absolute anathema to those of my generation who have a strong preference for being addressed by our title and surname. Except when writing envelopes, where I am one of the last people left alive still using “Esquire”. Far worse than that, though, is the fact that the aforementioned strangers then feel entitled to let you know exactly what they think of your performance on the box. This is, I will admit, moderately pleasant when they are flattering, but thoroughly depressing when they take the opposite view. And, human nature being what it is, people are far more likely to treat you to their opinions when they have something nasty to say. Luckily for me The Journal rarely posts my columns on its website, or I would no doubt long since have been driven into a despairing silence by vicious and always conveniently anonymous trolls. Funnily enough, my first ambition in life was to be a TV presenter. My role models were Eamonn Andrews off Crackerjack! and Mike Neville on Look North. Luckily I soon grew out of it because I realised that I am naturally shy and have a personality with somewhat specialist appeal. The most enjoyable aspect of the programmes for me has been receiving lots of emailed pitches from serious PR and media training companies, eager to point out where my client and I have been going wrong. But in a world where every chief executive, like every minister and MP, sticks rigidly to well-polished, politically correct and endlessly repetitious soundbites, isn’t it refreshing to hear from some people who say what they actually think and do so with a touch of humour? 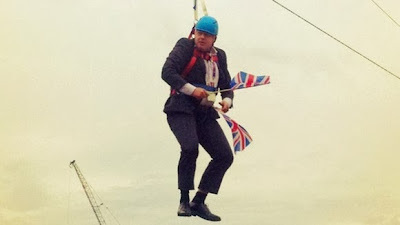 The only major political figure who has dared to adopt such a cavalier approach is Boris Johnson and it does not seem to have done him conspicuous harm so far, though I expect we will keep reading that he is “not serious enough” to be Prime Minister until the day he enters No 10. Asked in the early 1970s about the impact of the French revolution of 1789, the Chinese premier Chou En-Lai reputedly said that it was far too early to tell. Similarly, I imagine that the jury will be out until long after I have retired on whether allowing in TV cameras for reality documentaries confers any real benefit on the participants. I had thought it would all be over by the time I filed this column but in fact the final episode has been held over until tonight to make room for BBC2’s new series of The Choir (which is why, if you tuned in yesterday, there was less swearing and fewer PR gaffes than you had been expecting, but a significantly better standard of singing*). As a stickler for tradition, which means that the Hann family completely ignores the ghastly Americanised trappings of Halloween but goes big on celebrations of thwarted Catholic plots 408 years ago, I intend to spend this evening outdoors letting off fireworks and writing my name in the air with a sparkler. My last name, naturally, since that is the one I prefer. That will be quite enough of having my name up in lights for one year, and tomorrow I shall be very happy to return to the total obscurity that is my natural habitat. * I wrote that before I actually watched The Choir, where the standard of singing in fact made Iceland's own head office choir sound like the chorus of the Royal Opera House.